As the use of mobile devices continues to grow in the world, with more and more people using devices such as the iPhone — which have the ability not only to make calls with, but to access the internet, listen to music and play video games, as well as a multitude of apps — one of the main deterrents to their use can be the weather. Particularly in places that where winters can reach extreme levels of cold and simply pulling out your device to change a song can cause a blistering and unrelenting pain. That is where BearTek Gloves come in. 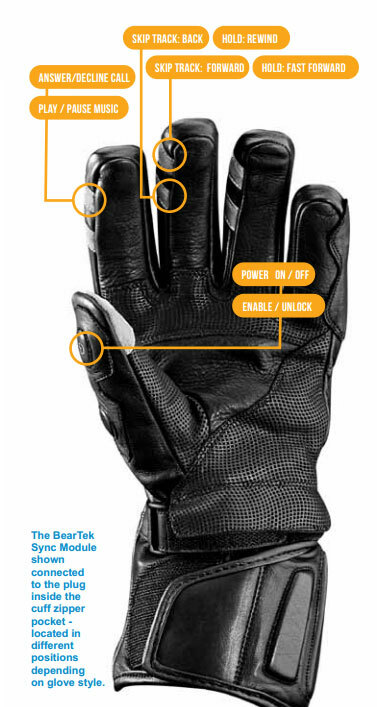 BearTek Gloves are designed to allow the wearer to control their wireless devices remotely, using a Bluetooth connection. They operate by using the thumb to press up against touch pads which are located along the sides of the fingers. It gives you the ability answer phone calls as well control songs. The gloves come in different versions. One is used for motorcycles, another for outdoor sports and also one for skiing. There is another version that allows use of a GoPro action camera using WiFi. The price of the gloves are determined by the different kits you purchase. The snow glove kit cost $120(USD), the motorcycle glove is $145, and there is a Winter classic kit that is $95. There are also Bluetooth and WiFi modules that cost $140 a piece. BearTek Gloves can be ordered from their official site here .